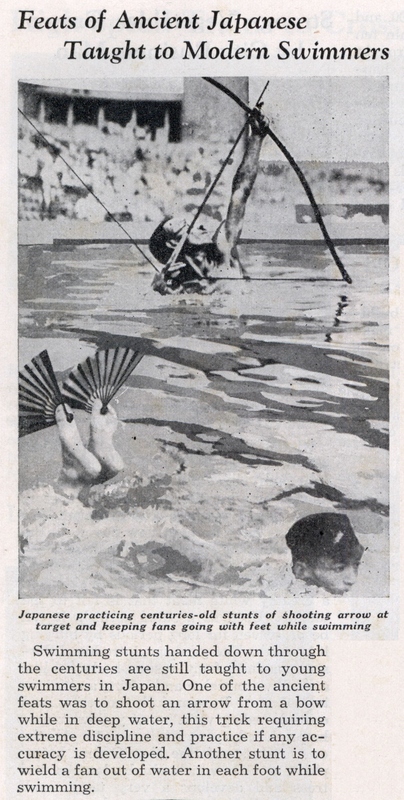 Swimming stunts handed down through the centuries are still taught to young swimmers in Japan. One of the ancient feats was to shoot an arrow from a bow while in deep water, this trick requiring extreme discipline and practice if any accuracy is developed. 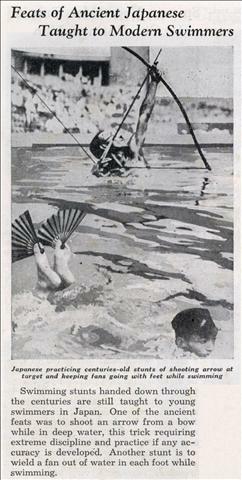 Another stunt is to wield a fan out of water in each foot while swimming. These are important skills for modern swimmers to have. Why is the swimmer wearing what looks like a military hat? They need to keep up with the times, now it is to shoot a rifle at a target while doing a double back flip off a diving board.